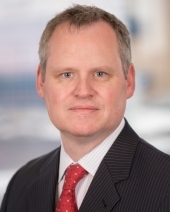 April 3, 2019 - Albany International Corp. (NYSE:AIN) announced today that its Board of Directors has appointed Stephen M. Nolan as Chief Financial Officer and Treasurer to succeed John Cozzolino, effective April 1, 2019. Nolan has over 16 years of experience in operational and strategic finance, most recently serving as CFO for Esterline, where he co-led the recently completed sale of Esterline to TransDigm Group Incorporated. Nolan has a bachelor's degree in engineering from Trinity College, the University of Dublin, a master's degree in civil engineering from the University of Massachusetts Amherst, and an MBA from the Massachusetts Institute of Technology. Albany International is a global advanced textiles and materials processing company, with two core businesses — Machine Clothing (custom-designed fabrics and belts essential to production in the paper, nonwovens, and other process industries) and Albany Engineered Composites (highly engineered composite parts for the aerospace industry). To learn more, please visit: www.albint.com.